This book is just...WOW. So good! It's a little slow at first, because of the details. But once you get into it a little more it's sooo good! I couldn't believe what happened at the end. Everything ties together so well, which is really difficult with mystery thrillers sometimes. I recommend this to anyone who loves a good mystery. Definitely worth the read. Jillian Talbot seems to have everything: a lovely home in Greenwich Village, a small circle of close friends, a handsome and passionate lover who has just proposed to her, and a glamorous career as a bestselling author of suspense novels. Her writing has captivated thousands of fans, but she has always been safe from the terrifying scenes she creates. Until now. Somewhere in the shadows of New York City, someone is watching her. He knows her every move, her every fear, almost before she knows it herself. He is as devoted as a lover, courting her in his own mysterious way - leaving notes in her mailbox, gifts on her doorstep, messages on her answering machine. 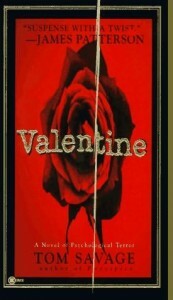 His motives are as cryptic as the name he goes by: Valentine. But his intentions are deadly clear. For Jill Talbot, the terror has just begun. Wherever she runs, he will find her. And soon she will meet him on his terrible day of judgment. His triumphant day. Her darkest day. Valentine's Day.